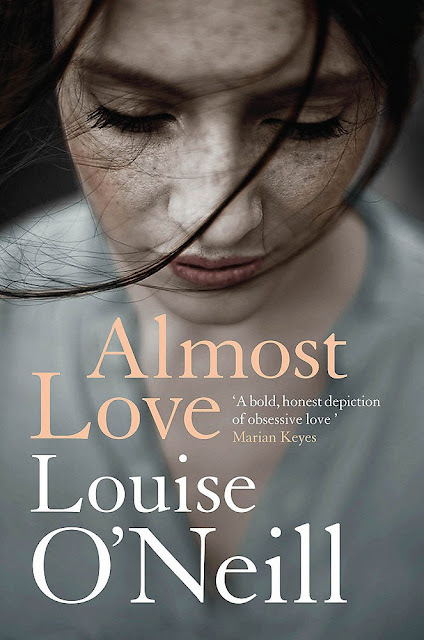 Almost Love by Louise O'Neill was published by Riverrun Books / Quercus Books on 1 March 2018. I admire Louise O'Neill so much, her previous novels, aimed at the young adult market were raw and bleak, but captivating. Her latest novel, Almost Love is aimed at the adult market. Yet again, the theme is dark and chilling and centres around the phrase 'if it doesn't hurt, it's not love.' There can't be many adult women who don't recognise the truth in that sentence and Louise O'Neill's story is full of hurt and longing, and yes, almost love. Lead character Sarah is a woman who is difficult to like, or to find any empathy for. She's selfish, self-absorbed, obsessed with her own happiness and totally disregarding of anyone else's feelings - no matter who they are. To be close to Sarah would certainly be painful for anyone, and she's not someone who I'd want to be friends with. However, dig deeper and it becomes clear that Sarah craves happiness, but she doesn't know how to find it, or what it really is. Not being able to like Sarah as a character does not stop me from adoring her creation, for she really appears real, and the flaws and multitude of mistakes only add to her complexity and depth. At it's heart, Almost Love is the story of Sarah's affair with Matthew. Their relationship was one-sided, becoming obsessive on Sarah's part, and changing the way that she saw the rest of her life. Her disdain for her hometown and the friends that still lived there and the way that she allowed Matthew to dictate the hows and the whens of the relationship show the level of her ability to self-harm. Whilst the harm may not have been visible to others, like marks on her skin, the damage to her own self-esteem and self-belief is immense. Almost Love is cleverly structured. Louise O'Neill tells Sarah's story in the 'Now' and the 'Then', allowing her readers to see how the events of 'Then' have impacted on the Sarah of 'Now'. The damage is deep and consuming and stops Sarah from allowing goodness and happiness into her life. Highly recommended from me. Almost Love is not the easiest of reads. It's unsettling and disturbing in parts, but the insight shown in the wonderful writing is brilliant. Louise O’Neill was born in west Cork in 1985. She studied English at Trinity College Dublin and has worked for the senior style director of American Elle magazine. While in New York, she also worked as an assistant stylist on a number of high-profile campaigns. Louise has written two award-winning books, Only Ever Yours and her most recent, Asking For It, which won Book of the Year at the Irish Book Awards. She is currently working as a freelance journalist for a variety of Irish national newspapers and magazines, covering feminist issues, fashion and pop culture. She lives in Clonakilty, west Cork.